Trumpet Mouthpiece Removal – Beware! This is a common issue we see in the workshop. Trumpet, or indeed any Brass mouthpieces, get stuck in the instrument due to dirt and moisture. Getting stuck is inconvenient but not terminal. There are a couple of removal tools (more on that later) and any good Repairer can do it within moments. However, what’s not a good idea is to try removing it yourself…with brute force! What is a Cornet and how does it Compare to a Trumpet? All brass players wonder at one time or another whether or not making a change to their mouthpiece will help. Could it give them more range, more volume or a bigger sound? 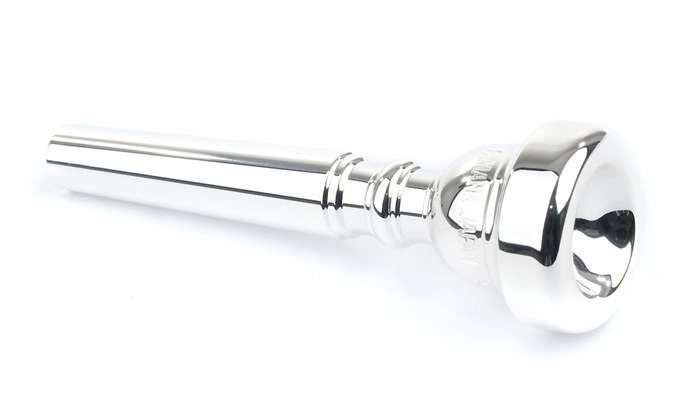 A change in the mouthpiece can yield fantastic results to the player. You can achieve faster, higher and louder from just a small change. This Bach Stradivarius Trumpet has had a new leadpipe fitted as the red rot on the underside rendered it un-preppable for relacquer. If metal is too rotten, it will not be able to withstand the invasive filing, sanding and pressure of the re-surfacing work. During the preparation of the surface, all dents and scratches have to be removed and the metal is filed and polished to a mirror finish. This is the most important stage as any remaining imperfections will show up tenfold under new lacquer. Many brass players will tell you that you can search for that elusive perfect mouthpiece, but never find it. Truer words have probably never been spoken but the benefits of trying to find a good compromise can be enormous. 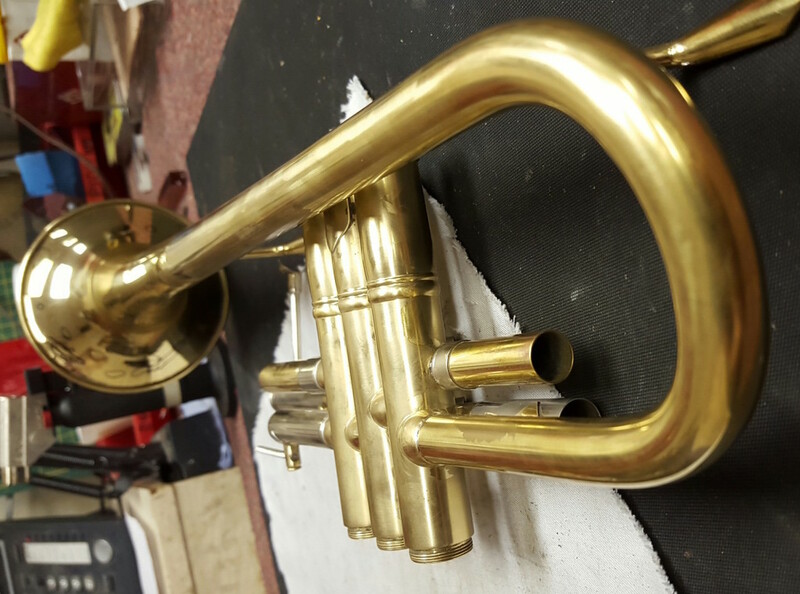 If you are looking to improve the squeakiest of lead trumpet parts, the mellowest of flugel tones or the meatiest bass trombone pedals, the chances are we have something to suit! Top US Trumpet professional Allen Vizzutti spent some time with us discussing all things Trumpet related. Problem: Waterkey spring has broken! This minor problem is easily repairable, all that is required is the correct parts, possibly a tool and some patience. It may not seem like a minor problem at the time, as the instrument will no longer be airtight and it will squeak and be wildly uncontrollable. Firstly identify the broken spring, and there can often be more than one. The water key will be flapping and have no tension to it. This is a problem for pretty much all brass players at one time or another. It can be caused by a dirty mouthpiece shank, or dirt in the mouthpiece receiver. It can also be caused by the mouthpiece taking a knock and getting shunted a little too far into the receiver. Depending on how stuck the mouthpiece has become, this is a repair you can attempt at home, but can often require a repair technician. Many thanks to all who attended ‘Trumpet-Fest’, a fun time was had by all and plenty of Trumpet bargains got snapped up including some of the NEW Cannonball Lynx Trumpets! We were delighted to welcome Allen Vizzutti into our store one afternoon in October 2013, as part of a European tour we were able to grab some time and sit down and chat about all things Trumpet and Allen’s extensive playing career and experience. We’re delighted to announce that East Berkshire Jazz Orchestra (EBJO), run by local youth music provider Berkshire Maestros, will be playing Live @ Dawkes as part of our Trumpet-Fest celebrations on Satruday Nov 16th. Endorsed by some really big names; Wynton Marsalis, Alison Balsom, Arturo Sandoval our very own Matt Sanders to name but a few! 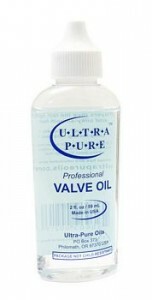 ULTRA Pure oil is a new type of synthetic oil. It is non-toxic and odourless making it the perfect choice for younger players, there is also no trace of the nasty “taste” some oils leave inside the instrument. Top US Trumpet ‘superstar’ Wayne Bergeron will be in-store at Dawkes on Saturday March 10th (10am-Midday). 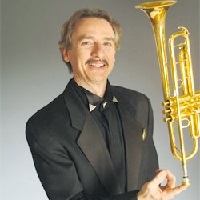 Wayne will be on hand to talk all things trumpet, technique, high notes etc and discuss his vast experience as the worlds #1 lead trumpet player. It’s been a busy couple of weeks in the brass band world, with the run up to the Spring festival and now in the last week before the Masters. We have been rehearsing solidly most nights for the last 3 weeks and along with my personal practice, and an instrument and mouthpiece change, my lips have taken quite a beating. It’s new product time again, and this time it’s the Yamaha YTR-5335G Trumpets, available in Lacquer and Silver Plate. Complementing Yamahas range from 1335 all the way up to 9335 the only real gap in the range was between the YTR4335 and YTR6335…thus the new model. So the first day of NAMM 2011 is done and as usual it was a long but interesting day. 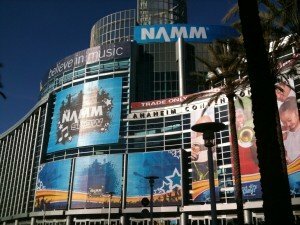 The NAMM show is probably the biggest trade show for the Music Industry and is usually the first place to find new products hitting the market. The NAMM (National Association of Music Merchants) association is highly regarded in the US for improving the exposure for all music making and the importance to education. The show is the place for worldwide manufacturers and retailers to talk business, instruments and education.